Most people know that monarch butterflies benefit from feeding on milkweed as caterpillars. Milkweed contains toxins, which makes the monarch butterfly unpalatable to most predators. The monarchs even use aposematic coloration to warn predators that they will be eating a toxic meal, should they choose to prey on the orange and black butterfly. But if milkweed is so toxic, why don't the monarchs get sick from eating milkweed? Monarch butterflies have evolved so they can tolerate the toxic milkweed. That's the answer often given to this question, but what does that mean, exactly? Are the monarchs actually immune to the milkweed toxins? Not exactly. Milkweed plants don't produce toxins for the monarch's benefit, of course, they produce toxins to defend themselves from herbivores, including hungry monarch caterpillars. Milkweed plants employ several defense strategies in combination to deter insects and other animals that might otherwise munch them down to the roots. Cardenolides: The toxic chemicals found in milkweeds are actually steroids that impact the heart, called cardenolides (or cardiac glycosides). Cardiac steroids are often used medically to treat congenital heart failure and atrial fibrillation, but historically they've also been used as poisons, emetics, and diuretics. When vertebrates like birds ingest cardenolides, they often regurgitate their meal (and learn a hard lesson!). Latex: If you've ever broken a milkweed leaf, you know that milkweed immediately oozes sticky, white latex. In fact, this is why Asclepias plants are nicknamed milkweed – they seem to weep milk from their leaves and stems. This latex is pressurized and laden with cardenolides, so any break in the plant's capillary system results in an outflow of toxins. Latex is also rather gummy. Early instar caterpillars are particularly susceptible to the gooey sap that all but glues their mandibles shut. Hairy leaves: Gardeners know that the best plants to deter deer are those with fuzzy leaves. The same principle holds true for any herbivore, really, because who wants a hairy salad? Milkweed leaves are covered in tiny hairs (called trichomes) that caterpillars don't like to chew. Some species of milkweed (like Asclepias tuberosa) are hairier than others, and studies have shown that monarch caterpillars will avoid the fuzzier milkweeds if given a choice. So, with all these sophisticated milkweed defenses, how does a monarch manage to feed exclusively on hairy, sticky, and toxic milkweed leaves? Monarch caterpillars have learned how to disarm the milkweed. If you've raised monarchs, you've probably observed some of these strategic behaviors by the caterpillars. First, monarch caterpillars give the milkweed leaves a buzz cut. Early instar caterpillars, in particular, are quite skilled at shaving the hairy bits off the leaf before chowing down. And remember, some milkweed species are hairier than others. 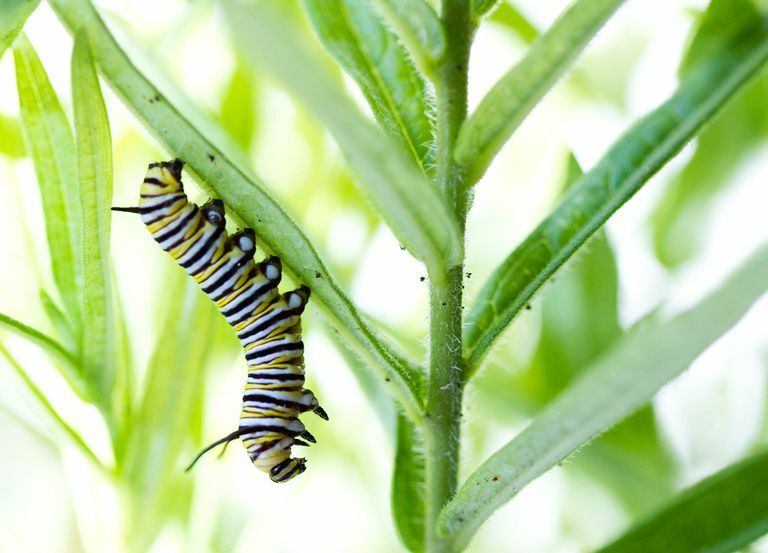 Caterpillars offered a variety of milkweeds will choose to feed on plants that require less grooming. Next, the caterpillar must tackle the challenge of the latex. A first instar caterpillar is so tiny this sticky substance can easily immobilize it if it isn't careful. Perhaps you've noticed that the smallest caterpillars will chew a circle into the leaf first, and then eat the center of the ring (see inset photo). This behavior is called "trenching." By doing so, the caterpillar effectively drains the latex from that small area of the leaf, and makes itself a safe meal. The method isn't foolproof, however, and a good number of early instar monarchs become mired in latex and die (according to some research, as many as 30%). Older caterpillars may chew a notch into the leaf stem, causing the leaf to droop and allowing most of the latex to drain out. Once the milky sap stops flowing, the caterpillar consumes the leaf (as in the photo above). Finally, there's the problem of the toxic milkweed cardenolides. Contrary to the story often told about monarchs and milkweed, the evidence suggests that monarch caterpillars can and do suffer the effects of consuming cardiac glycosides. Different species of milkweeds, or even different individual plants within a species, can vary significantly in their cardenolide levels. Caterpillars feeding on milkweeds with high levels of cardenolides have lower survival rates. Studies have shown that female butterflies generally* prefer to oviposit their eggs on milkweed plants with lower (intermediate) cardenolide levels. If the ingestion of cardiac glycosides was wholly beneficial to their offspring, you would expect females to seek host plants with the highest toxicity. Which Will Win the War, Monarchs or Milkweeds? Essentially, milkweeds and monarchs have waged a long co-evolutionary war. Milkweed plants keep throwing new defense strategies at the monarchs munching on them, only to have the butterflies outwit them. So what's next? How will milkweeds defend themselves from the caterpillars that simply won't quit eating them? It appears the milkweed has already made its next move, and opted for an "if you can't beat them, join them" strategy. Instead of deterring herbivores like the monarch caterpillars, milkweeds have accelerated their ability to regrow leaves. Perhaps you've noticed this in your own garden. Early or mid-season monarchs might strip leaves from a milkweed plant, but new, smaller leaves sprout in their places. * - New research suggests that female butterflies may sometimes, for medicinal purposes, select host plants with higher cardiac glycoside levels. This seems to be an exception to the rule, however. Healthy females prefer not to expose their offspring to high levels of cardenolides. Interactions with Milkweed, MonarchLab, University of Minnesota. Accessed January 8, 2013. 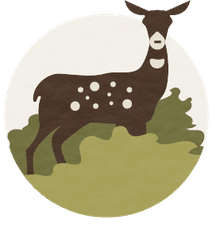 Biodiversity theory confirmed Cornell Chronicle, Cornell University. Accessed January 8, 2013. Monarch Biology, MonarchNet, University of Georgia. Accessed January 8, 2013. Monarch Butterfly Habitat Needs, U.S. Forest Service. Accessed January 8, 2013. Answers From the Monarch Butterfly Expert: Spring 2003, Q&A with Dr. Karen Oberhauser, Journey North. Accessed January 8, 2013. Cardiac Glycosides, Virginia Commonwealth University. Accessed January 7, 2013. Arms Race between Plants and Insects Escalates through Evolution, by Elizabeth L. Bauman, College of Agricultural and Life Sciences at Cornell University, Fall 2008.